Summer veg is the star of this healthy vegetable curry recipe. 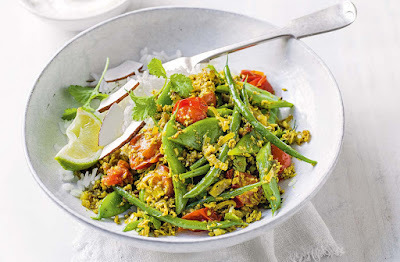 Green and runner beans provide vibrant crunch to a fragrant Thai curry and tomato base for a quick and simple vegan meal. Heat the oil in a large frying pan over a medium heat. Add the mustard and cumin seeds; heat for 30 secs-1 min until starting to pop. Add the turmeric and shallots; fry for 5-6 mins until softened. Add the curry paste, cook for 2 mins, then add all the beans, the tomatoes and a splash of water. Cook over a medium-high heat for 8-10 mins until veg starts to soften but still has crunch. Season; scatter with coriander and coconut. Serve with lime wedges and rice, if you like. Tip: There are over 130 known varieties of green bean and they are often also called French or string beans. Any variety will work well in this curry, just trim the stalks and cut in half if very long.